Do you have questions? Contact us! Administrative Office of FIR e. V.
take the 1st exit in the roundabout and follow the road for 600m until Campus Boulevard 55. Route description from motorway A4 by Google Map Maker. from both of the airports there exist train connections to Aachen. both stations have good bus connections to Campus-Boulevard. Take bus number 3A or 13A Richtung Ponttor, get off at "Kaiserplatz". There, take the connecting bus number 12 or 22 towards "Campus Melaten". Get off at "Wilfried-König-Straße". You are now on Campus-Boulevard; house number 55 is located 100 meters behind you on the same side of the street. ... from Station "Aachen West"
Turn left at the end of the stations' stairs to reach the bus station. 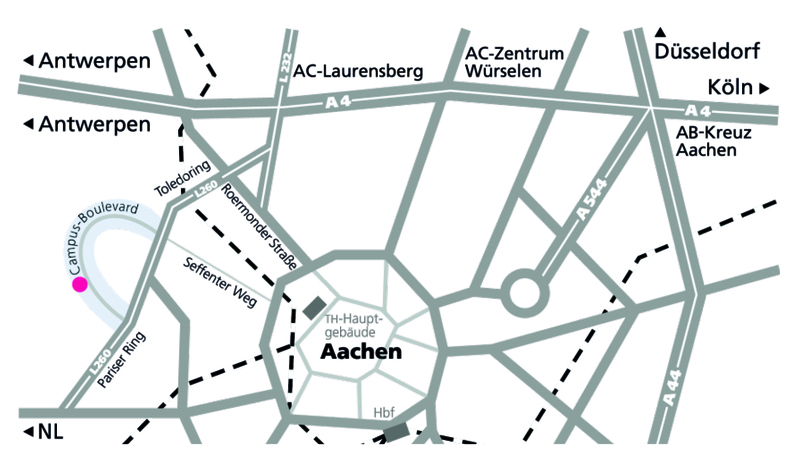 Map of station "Aachen West". Take Bus number 3A, 33 or 73 towards "Campus Melaten" / "Uniklinik". Get off at bus stop "Stiewistraße". Turn right into the street "Campus-Boulevard". It takes about 8 minutes by foot to reach house number 55/57. Bus number 3A, 33 or 73 towards "Campus Melaten" / "Uniklinik". Get off at "Hörn Brücke" and take bus number 12 or 22 towards "Campus Melaten". Get off at "Wilfried-König-Straße". Turn right and follow the street "Campus-Boulevard" for about 100 meters to house number 55/57.